During the Christmas lead up, my writing group had a "do". We also decided we'd have a Secret Santa and bring one of our favourite books, gift wrapped, and without tags, so that it would be a lucky dip. That way, hopefully, we'd all get to read a book outside of our normal genre choice. I chose to submit "HOLES". I love, love, love this book. The Yelnats family have a history of bad luck so when Stanley is falsely accused of a crime, he's not surprised. He's sent to Camp Green Lake (a place that isn't green and doesn't have a lake) a Juvenile Detention Centre. The evil warden there makes the boys dig holes every day in the blistering heat. Is this just a pointless punishment or does the warden have a secret agenda? It's been a few years since I read this book, so I dug out my old copy and read it again. What a total treat. As before I had to place the book face down a time or two just to catch my breath. This is the book I wish I had written. The fascinating double narrative is a master class in layering. Although the structure is fairly complex it's written so well that it is always understandable. It has some deep themes and the plotting is flawless. The brevity of the language makes it a joy to read as well. 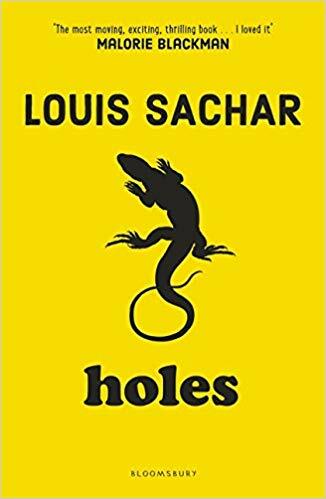 I think that "Holes" is an outstanding YA read. A real "Wow" book. Absolutely one of my all time favourites.